Ben Briggs, our Head of Marketing, recently returned from a Mekong River Cruise, where he discovered the section of the river which travels through Vietnam and Cambodia. Visiting a country through a cruise on its waterways allows you to gain an insight into the local’s true way of life. Read Ben’s trip report below to inspire you on your own Asia River Cruise. Why Choose a Pandaw Cruise? 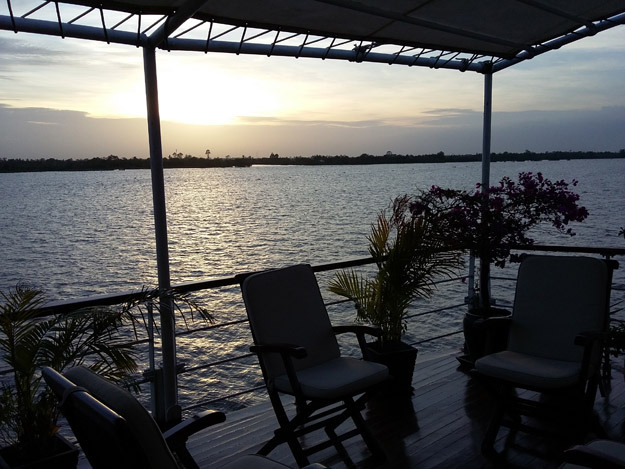 If your idea of a river cruise is to sit back, gin and tonic in hand and watch one of the Asia’s greatest rivers flow by, then a Pandaw river expedition is for you. 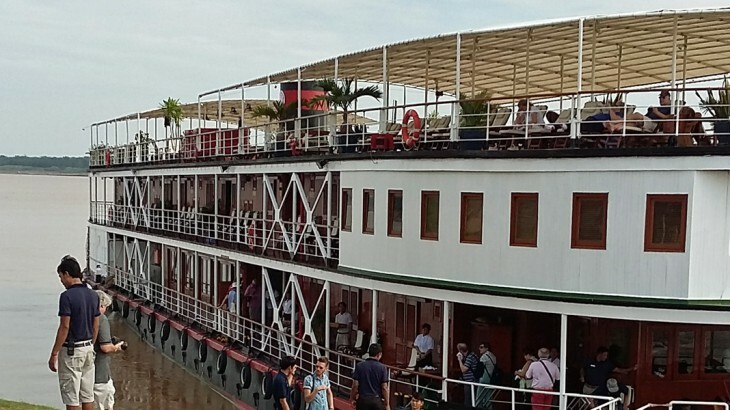 This extended 7 night Mekong River cruise will take us through some of Vietnam and Cambodia’s most beautiful scenery. 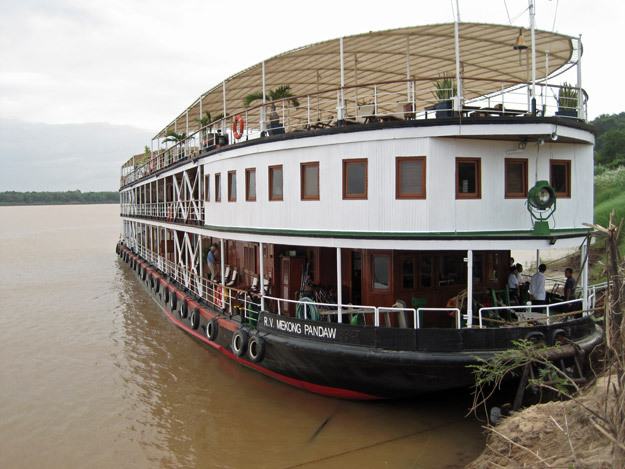 What’s more, a Pandaw cruise will take you further than any other boat to the upper reaches of the Mekong due to its shallow draft being able to navigate through shallow waters. As a result, you will have the opportunity to see rare river dolphins, something I was particularly keen to witness. 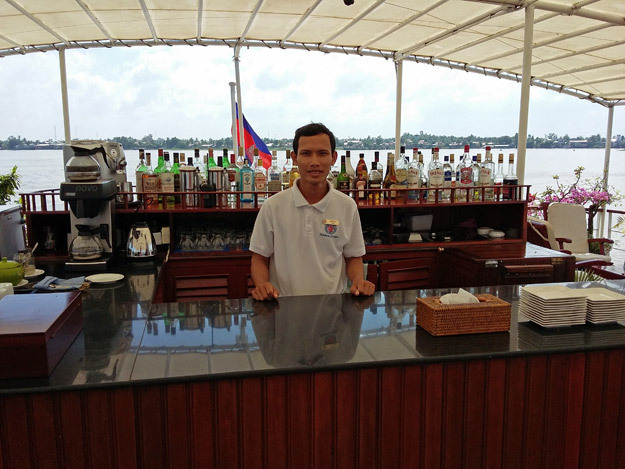 Joining the ship not far from Saigon, you’ll be met by a smiling crew with cold towel in hand and a refreshing glass of pineapple juice. This high-level of service sets the tone for the rest of the cruise. With a maximum of only 48 guests and a crew of 30 or so, Pandaw are able to offer a very personal experience. After a day or so they’ll know your name and vice versa and you’ll soon be sharing stories together. This is one of the things that sets Pandaw apart from other cruises and you are made to feel like you are coming back home every time to leave the boat. One typical example of the high levels of personal service that you’ll enjoy is every time you return from a shore excursion the crew will take your shoes to clean them and deliver them straight to your room 10 minutes later. Always with a smile. Plus another crew member will hand you a much needed cold towel and a glass of something cold to quench the thirst. One big advantage that river cruising offers is the opportunity to access areas that are not reachable by land. As a result you’ll see local Cambodian life just as it should be, unfiltered and genuinely authentic. During the shore excursions that are all included in your cruise, chances are that you’ll be greeted by smiling local children eager to catch a glimpse of this stranger in their land. Even as you cruise along the mighty Mekong, kids will be waving and shouting from the riverbank, waiting for you to return their excited gestures. One of the highlights of the trip for me and for all of my fellow guests was a visit to a library that Pandaw built to help support a local village as well as meeting pupils in a school. Having the rare opportunity to sit with the kids and helping them read is something that we’ll all remember for the rest of our lives. On the seven night cruise you’ll also spend a day in Phnom Penh learning about the terrible history during the time of the Khmer rouge. A moving and difficult day for many of us but important to understand. Food on board is excellent with a wonderful array of local produce including the widest choice of fruit I have ever seen. 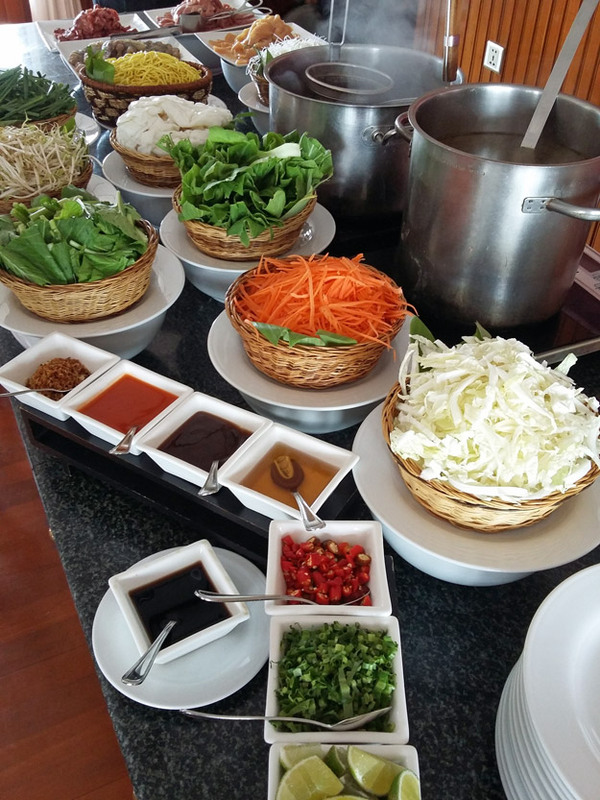 Breakfast offers a huge range of both western and local options whilst there are always at least 3 main courses to choose from for lunch and dinner. It is also a very relaxed, social affair with guests seated together, so you will get the chance to mingle with as many or as few of the other guests as you like. The boat itself is a beautiful thing. Dark teak wood mixed with brass handles and sunloungers stretched across it’s vast sun deck, it’s as comfortable as you’ll find on this river. Cocktail hour begins each day at 6 and there is even a cinema room, gym and spa should you wish to prize yourself away from the glorious views surrounding you. 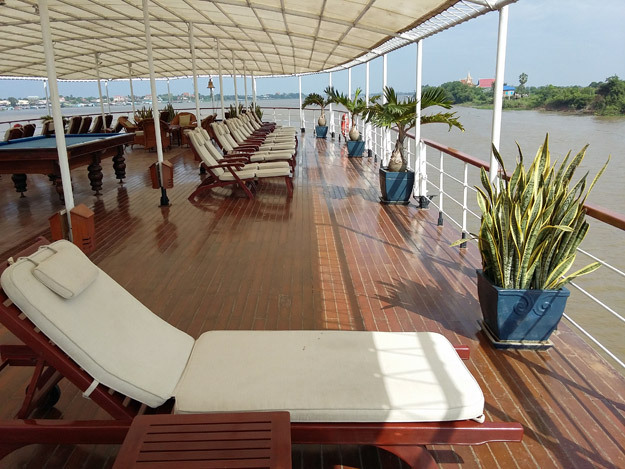 A journey along the Mekong with Pandaw is like no other journey on earth and with other ships in Burma, Indonesia, Laos and South America, I cannot wait to be welcomed home once more. 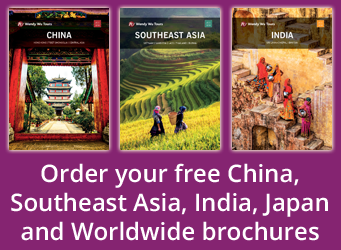 Explore the rivers of Asia with Wendy Wu Tours and Pandaw. Tour your chosen destination and explore life on the river for an unforgettable, fully inclusive holiday. Cambodia, Vietnam cruise, sightseeing, transport. permalink.